A 1933 Chrysler CL Imperial Dual-Windshield Phaeton and modern Ferraris are early leading lots for the 2017 RM Sotheby’s Arizona Biltmore classic car sale. The 1933 Chrysler CL Imperial Dual-Windshield Phaeton was the personal car of LeBaron’s renowned automotive designer Ralph Roberts and had groundbreaking design features. In addition to several further pre-Second World War American classic, modern Ferraris will also feature including the Enzo that originally belonged to Tommy Hilfiger. In 2017, RM Sotheby’s first classic car auction of the year will be for the 18th consecutive year during the traditional Scottsdale, Arizona, classic car week in mid-January. RM Sotheby’s will offer around 120 cars at two auctions on 19 and 20 January 2017 at the Arizona Biltmore in Phoenix. In 2016, RM Sotheby’s set a new Scottsdale and Arizona auction week record when a 1937 Mercedes Benz 540 K Special Roadster sold for $9,900,000 – the third highest price ever paid for a Mercedes Benz car and coming tantalizingly close to the $10 million mark. In 2016, the RM Sotheby’s Arizona classic car auctions grossed $62.8 million from the 149 cars on offer with a sell-through rate of 85%. Although not the most-expensive car on offer, the 1933 Chrysler CL Imperial Dual-Windshield Phaeton (Est. 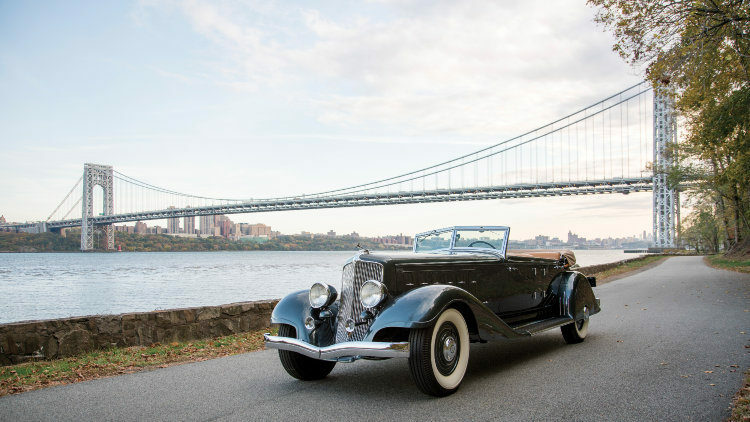 $1,400,000 – $1,800,000) is attracting much attention, When it comes to American Classics, the one-off 1933 Chrysler CL Imperial Dual-Windshield Phaeton set for RM’s Arizona sale is groundbreaking in design. Believed to be the last example completed, chassis no. 7803657 was the stunning personal car of LeBaron’s renowned automotive designer Ralph Roberts. This Chrysler is more than just a custom creation, it is an important design statement—a reflection of Roberts’ forward-thinking genius and his ideas and philosophies about what a modern automobile should be. From its low-mounted headlamps to its extended fender line, aerodynamic rear fender skirts and dual rear-mounted spares, such styling cues were ahead of their time, and their influence can be clearly seen on the Chrysler Airflow and Airstream models that followed. Further differentiating 7803657 from its peers, it was the only CL Imperial Dual-Windshield Phaeton to have its radiator shell painted as opposed to chromed, along with its headlights and horns, a very unorthodox idea in 1933. Beyond its magnificent styling, 7803657’s provenance is elevated by its well-known ownership history which includes the renowned Milhous and Otis Chandler Collections, along with various successes on the show field, including Best of Show at the Concours d’Elegance of America at St. John’s, and Best in Class at the Pebble Beach Concours d’Elegance (Est. $1,400,000 – $1,800,000). In keeping with past tradition, entries for RM’s 2017 Arizona sale will offer tremendous diversity, ranging from pre-war classics through to important sports and racing greats and contemporary supercars. To this end, the elegant, flowing lines of the Chrysler CL Imperial will be juxtaposed by the appearance of two of Ferrari’s hottest modern supercars: a 1995 F50, and a 2003 Enzo. Essentially an F1 car for the road, the F50 combines cutting-edge, Formula One-inspired innovation and technology with a road car platform. From a design perspective, it is differentiated from its supercar siblings by its open-top, enabling both driver and passenger to enjoy the car’s full exhaust note. A U.S.-spec example, the 1995 Ferrari F50 set for RM Arizona is one of very few completed in black, and sports just 2,000 miles from new (Est. $3,000,000 – $3,500,000). Designed by Pininfarina, the Enzo was a drastic departure from the cars that came before. From nose to tail, form was secondary to function providing for an unrivalled driving experience. Gone was the massive rear wing that defined both the F40 and F50, replaced by a small speed-activated spoiler at the rear, while the protruding nose was a styling cue taken from Ferrari’s contemporary Formula One cars to highlight its use of race-inspired technology. The 2003 Ferrari Enzo set for RM’s Arizona sale comes from the collection of fashion mogul, Tommy Hilfiger. Purchased new by Mr. Hilfiger, it is one of very few examples in the U.S. that have remained with its original owner. Exceptionally well maintained, it is also low mileage, showing just over 3,600 miles on its odometer (Est. $2,700,000 – $3,000,000). Additional early highlights for RM Sotheby’s Arizona 2017 sale include: a 1938 Bugatti Type 57 Cabriolet, beautifully presented with exceedingly rare coachwork by Letourneur et Marchand (Est. $1,250,000 – $1,500,000); along with an exciting series of modern classics from the 1980s and 90s. Included in the latter group is a 7,986-original mile, ‘flying mirror’ 1985 Ferrari Testarossa, complete with Ferrari Classiche certification (Est. $130,000 – $160,000); a 1990 Mercedes-Benz Cosworth 190 E 2.5-16 Evolution II, the first EVO II offered publicly in North America (Est. $225,000 – $275,000); and, a 1997 Porsche 911 Turbo S, striking in original Yellow over Black and showing 12,150 original miles (Est. $425,000 – $550,000). Results from Scottsdale, Arizona 2016: Bonhams, RM Sotheby’s, Gooding, Barrett-Jackson.